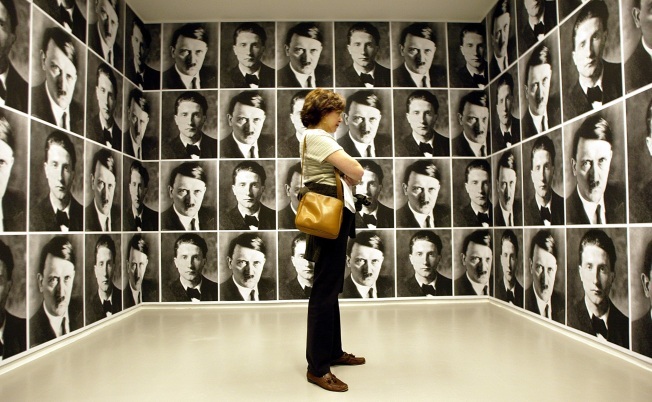 Adolf Hitler is more often a subject than creator of gallery art, such as this exhibit of photographs of Hitler and artist Marcel Duchamp created by artist Rudolf Herz titled "Zugzwang" as part of the Mirroring Evil: Nazi Imagery/Recent Art exhibit at the Jewish Museum in 2002. You too can be the proud owner of a work of art painted by Adolf Hitler as a young struggling artist. And it will only cost you your soul. Newly discovered Hitler paintings will go up for auction in April, as reported by the New York Times and Reuters. One of the paintings is even said to be a self-portrait — not exactly the sort of thing that makes you feel cozy when it's hung above the fireplace. The auction house conducting the sale, Mullock’s, claims that the 13 paintings are by Hitler, but this is notoriously tricky to authenticate. Hitler struggled for years as a young art student in Vienna and never made much headway, and later in his life any work he produced was... let's just say nobody's primary concern about the man. The authenticity of similar works sold at auction in Cornwall, England, in 2007, was vigorously questioned. Because of such concerns, the paintings are expected to go for highs of only $580 to $1,448 dollars each. But really who would want such a thing? Especially if it were authentic.